Welcome to Craft Storage Idea’s special feature…Flickr Craft Rooms! This is Cicily the Pink Dalmatian Scrapper and I actually signed up for Flickr to work out this post. I have to say that I’m actually glad to be signed up. There’s nothing more frustrating then trying to follow a link on Pinterest and have it end at Flickr and not be able to see more. Problem solved! Well on to the craft room that caught my attention, Sugar Sugar Studio. If you could take spun cotton candy and frosting and turn it into a craft room you’d get Sugar Sugar. So aptly named. While lacking a full room shot I love all the bits and pieces that certanly make this room unique. Check out this Sweet banner and inspiration board. This cabinet has been with her for a while, but to coordinate it with the Sugar theme, she painted it white and Mod Podged patterned paper pieces to the back panel. Every corner and shelf is a treat with all the unique storage containers like these old cupcake tins. These jars are re-purposed garage sale finds that have been painted to look so sweet. You can see the whole Sugar Sugar studio set here. Hi all! Noelle here with a craft room tour for you guys today. I happened upon this room while looking for photos for the jar storage post I had up recently. And when I came upon this blog post at Traveling at the Speed of Light, I just stared at it for the longest time. Then I started frantically pinning photos since I just KNEW this was the next room I’d like to feature here on Craft Storage Ideas. Part of the reason this room appealed to me so much is that this is like my dream craft room. I just LOVE Kendra’s style. 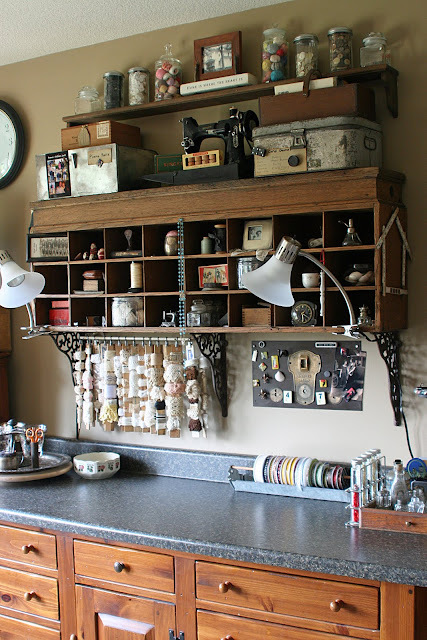 I love her use of vintage items for storage. I love the happy shade on the walls. I love the pops of red, and the way she describes how she stores thing apply to me too. I also don’t want to spend a lot, and I want things that can change what they store as my needs change for whatever my latest mediums are. Well enough explanations, shall I show you some eye candy from Kendra’s blog? Don’t you love how in the photo above she’s used a glass display case to store her crafty items? And on the next photo below, she uses a hen nesting box above her workspace to store alterable items. 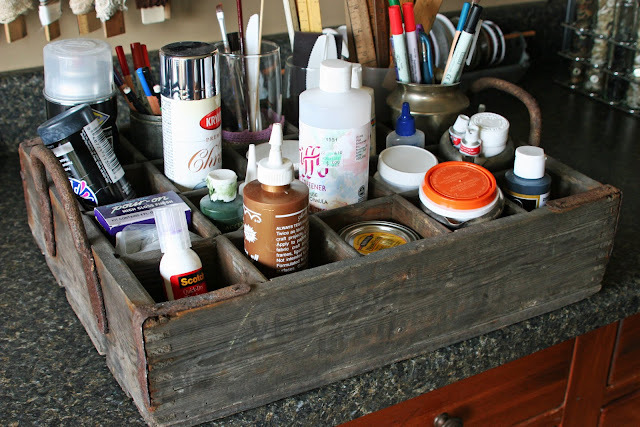 This is an awesome use of a vintage workbench for storage and workspace, too. And isn’t that red stool an awesome find? Especially from a garage sale for only a few dollars. Gorgeous vintage canning jars for embellishment storage, I have GOT to find some of these jars! Kendra’s homemade clip storage with shelf, which she painted to match her decor. An inexpensive discount-store trifle bowl works well for packaged embellishments. Vintage cake pan for liquid adhesive storage, this is so pretty, and I love how it hides things away that you might not want to look at. There is all KINDS of other great storage ideas on Kendra’s blog here. I love how she made small storage cases from old instant coffee tins, and she adds so much style to everything with rustic finishes and a repeated star motif throughout the space. Kendra, I COVET your craft room! Hope you all have enjoyed this tour and I’ll see you back here soon with some more storage tips! 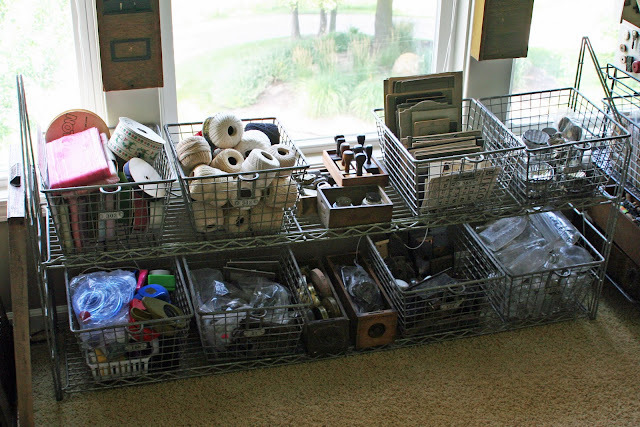 I have always enjoyed seeing other people’s vintage-inspired craft rooms. I’m in awe of their ability to mix and match so many wonderful treasures into one area – not something I would be able to pull off without it looking like a jumbled mess! Danielle of Blessed Serendipity, certainly has the knack! Everywhere you look, there are adorable vignettes. I love the tall jar with all the vintage flowers! And how precious is this antique baby buggy with crochet thread? Of course her craft table would also have to be filled with vintage goodness! What a clever use of an old door! Be sure to check out Blessed Serendipity for even more amazing photos. Hi everyone, Anita here and it is my turn to share a fabulous studio with you. While browsing the web I came across a really inspiring, vintage styled studio, Mamie Jane’s. I love the look of this room and how everything is displayed. Look at this beautiful antique cubby she has! I love this thing, I have been looking for something like this for a while to store little odds and ends on. Ok, how handy is this little thing! What a great way to store all your adhesives where you can see them and they will all stay upright. Love the locker baskets she has here, and all the pretty things she has in them! Mmmm…wonder where I can find some of those?? She even has her punches stored in one. How creative is this? 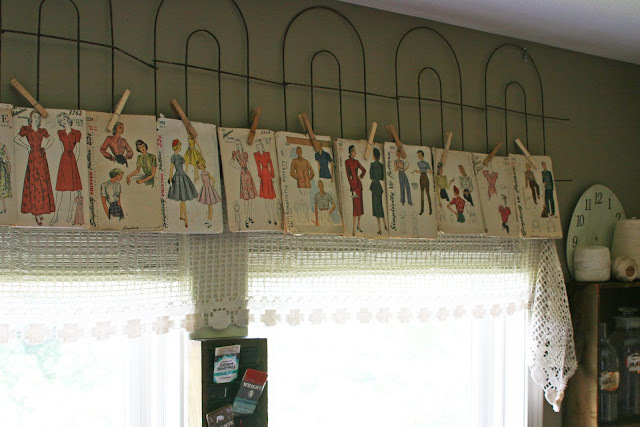 Instead of sticking all of her patterns in a drawer, she used clothes pins and hung them on a rod above the window as a mock curtain! What a fun way to be able to see what you have on hand, and make your space visually appealing at the same time! Be sure to stop by Jane’s Blog to see more photos of her wonderful studio space. She has so much to see. I’m Bethany–a wife, mom to a furry “dog-ter,” English teacher, crafter, blogger, want-be-decorator, aspiring photographer, and costume jewelry lover. It’s my desire to leave the world a little more beautiful than I found it. If it were up to me, I would have hung some shelves or other storage pieces on my walls. My home is older and my walls are made of plaster, so hanging items on the wall is a headache. I normally only hang items for which I can use Command Adhesive strips. 2. What was/is your greatest challenge? My greatest challenge was the large amount of crafting supplies that I have. I had to make them all fit in an organized way into a small room. Making over the hutch from my grandmother’s house was a life-saver! If it wasn’t for that piece, I don’t know that I would have been able to organize the room. I like to “organize it once,” but since I’m a self-proclaimed craft supply hoarder, I am constantly trying to find ways to make the new stuff I buy fit without sacrificing the peaceful, organized look of the room. The plastic shelves in my closet are useful, but I really wish I could outfit the entire closet with some type of closet organization unit. I would have so much more room to store things! Hello, beautiful space! Huge thanks to Bethany for sharing. What is your favorite part about her studio? See more of Bethany’s space and work at Pitter & Glink! I’m so excited to introduce Kimberly Congdon, better known as Scrap it Girl, to you all! I think you are going to love her craft rooms. Did you catch that? She has more than one craft room! Check it out below! Hello! I started papercrafting regularly when I was 17. I mainly scrapbooked and made home décor items or gifts. In the last 5 years I’ve started teaching papercrafts and expanding into card making and altered items. I currently teach 3-7 classes per week at several locations and I started my Scrap It Girl business in January 2008. I enjoy working with local stores, teaching paper crafts, and meeting new people. I couldn’t ask for a better job! Life is good. Now on to my craft space! I have over 1,200 sqare feet of finished craft space in my basement. That 1,200 square feet is divided into four specific craft areas – the Scrap It Girl Store, classroom with a wet-bar area and bathroom, my personal craft space and scrapbook storage room for back up supplies and products not used everyday. Having all of that space for crafting has come at a price. When my husband and I first looked at buying our home we loved the finished basement. However, I knew we would need to make a few changes to it since I knew it would become my crafting space. We set up a playroom and family room and I took two of the rooms for my craft rooms. Two days after we moved in and were completely unpacked…the basement flooded. We had to replace the carpet, wood flooring and the baseboards. Trying to take advantage of a bad situation, we decided to carpet more of the basement so there was more usable space. I also decided to move the family room into a smaller room so I could have more crafty space. The largest open area in the basement is now my classroom. I can seat 20 card makers or 12 scrapbookers at one time. There is also a wet bar area for snack or painting projects. I have a bathroom, microwave, coffee maker, refrigerator and television in that area too. After living in the house for a few years, we had another flood. Then came a new paint job, new carpet again, more changes. I decided my kids no longer needed a playroom so I turned that room into a mini store. I mainly sell products that are not for sale in our local big box stores. I do, however, sell some of my favorite products or items I use for classes and adhesive. On the other side of the classroom is my personal work area, however I don’t actually work in that room. There is also the craft room storage room in another part of the basement. That room is full of cabinets and countertops and I use it for back up supplies, punches, stamps, inks, albums and paper. I don’t really have a budget. I add to my space as I find new things to use for organizing. I rearrange the room at least once a month and that is when I typically add a new vintage find or take out something. My friends tend to give me pieces of furniture they no longer want and I try to refinish them and add them to the space too. When it starts to get crowded I rearrange and move things out. Some things get moved to other areas of the house, too. My greatest challenge is having to keep the middle of the room open. I need to keep the center area completely clear at all times, I also need to keep this room clean at all times. My customers and students need to walk through this room in order to get to my classroom and mini store. Everything I work on has to be put away right away. I also need to know where everything is just in case I need something for a class. My storage solutions are constantly changing. Sometimes weekly. I get things dropped off from friends when they come to a class, or I pick up something new, or I get an order for new products, so I need to make room. I would like to improve on organizing projects I am currently working on for stores or design teams. I feel like I have piles of projects on my tables. It is kind of out of control. I also need to keep track of what products are being used on what projects. I wish I had a storage solution for each store or design team. Isn’t Kimberly’s space amazing? I’m so jealous! And if I lived near her, I think I’d take my stuff to her workroom, plop down and never go home! To see more of Kimberly’s work and see her schedule of classes (if you are lucky enough to be nearby), check out her blog!